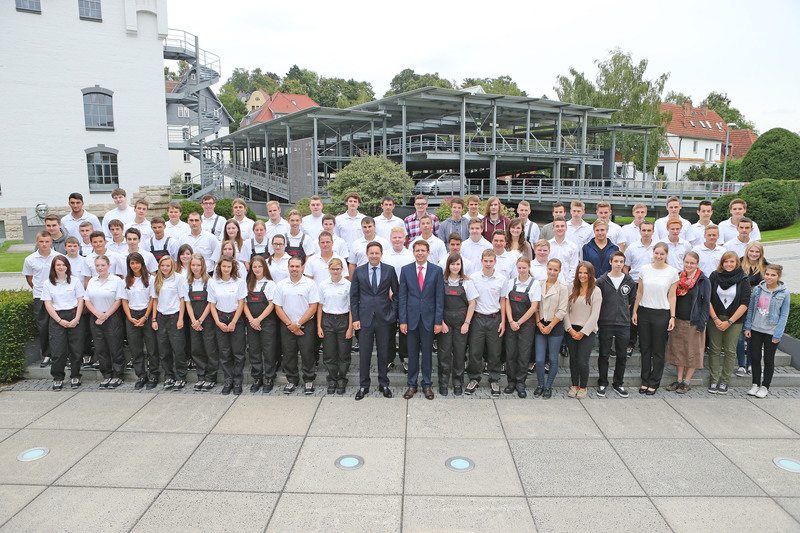 108 young people will launch their professional careers at Brose when the new training year begins: on September 1, 2013, 73 young men and women will begin their apprentice training in one of the eight industrial/technical and commercial vocations. A total of 47 apprentices are undergoing training at the Coburg and Hallstadt locations, 22 in Würzburg, 2 in Wuppertal and 2 in Berlin. In addition, Brose Gastronomie GmbH is training a cook in Coburg. From October 1 on, a further 35 junior members of staff at the Coburg, Hallstadt, Wuppertal and Würzburg locations will commence dual studies programs in mechanical engineering, electrical engineering, industrial engineering and business informatics. Brose is proud to offer this demanding, practically oriented training program in conjunction with the Baden-Württemberg Cooperative State University and the Coburg University of Applied Sciences. The program combines university attendance with assignments at the company. “Apprentice training is a key component in our efforts to promote the development of our junior staff members. We challenged applicants with high expectations both in terms of academic performance and social skills again this year. The young adults who personally convinced us of their potential during the hiring process can look forward to solid apprenticeship training at Brose. Moreover: young people will find a wide range of promising career perspectives both here and abroad in our internationally active company,” explains Michael Stammberger, Manager Apprenticeship at Brose. The Brose training concept challenges apprentices while promoting both professional and social skills. Brose offers a variety of options to help them further enhance these skills, including regularly scheduled language courses or stays abroad in Europe or overseas that can last anywhere from a few weeks to a few months. The Junior Company is another crucial component of the Brose training concept: this “learning company” with locations in Coburg, Hallstadt, Würzburg and Wuppertal helps young Brosians develop essential core skills during the first two years of their apprenticeship that will prove invaluable throughout the rest of their career. “This program helps them learn to act independently and take personal responsibility. In addition, they strengthen their professional, methodological and social skills as they work on specific company assignments,” says Stammberger of the objectives of this practically oriented project. The German Vocational Training Association (DBA e.V.) awarded Brose its “DBA-Cert Quality Seal” in recognition of the company’s excellence in apprenticeship training. “The quality seal shows applicants that the Brose apprenticeship program delivers on its promise,” underscores Stammberger. Brose is holding a five-day orientation seminar at the Neukirchen Youth Club in Lautertal during the first week of September to help launch the new employees’ careers. The seminar is designed to introduce the young people to the company and the working world. They will also learn more details about their future training in group work. The Brose Group currently provides vocational training to over 300 apprentices and students enrolled in dual studies programs. A total of 207 are located in Coburg and Hallstadt, 85 in Würzburg, 19 in Wuppertal and 8 in Berlin. In addition, there are around 50 apprentices at 8 locations around the world.